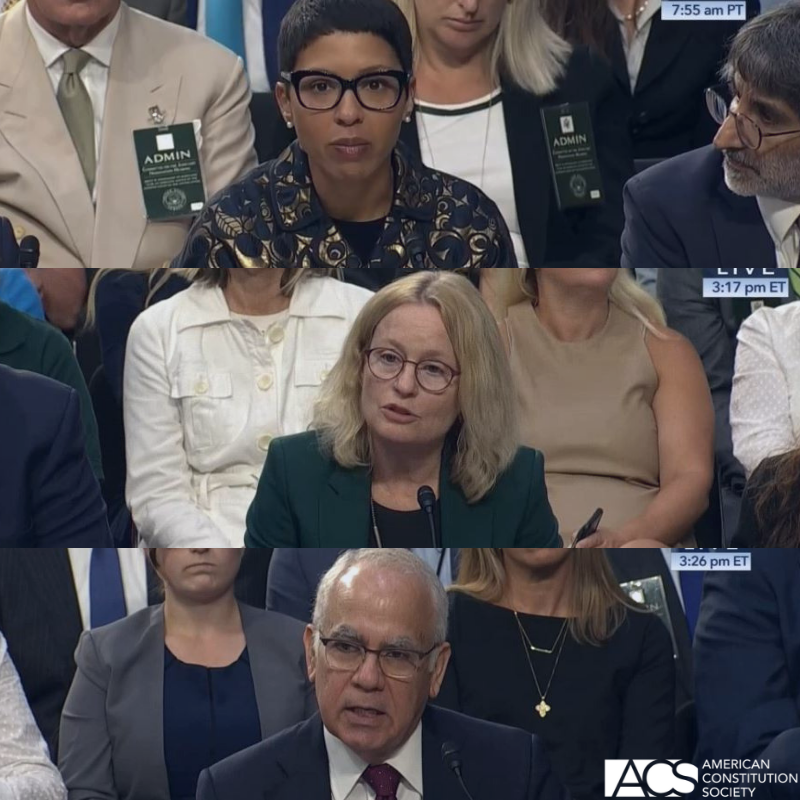 The Senate Judiciary Committee concluded Brett Kavanaugh's Supreme Court confirmation hearing on Friday by listening to witness testimonies, several of which were delivered by ACS members. ACS Board member Professor Melissa Murray of New York University School of Law gave a powerful testimony about the threat that Kavanaugh's confirmation would pose to women's reproductive rights: "Judge Kavanaugh’s judicial record evinces a very narrow view of constitutional protections long recognized by the Supreme Court, especially when it comes to women’s decisions concerning their bodies and their health care needs." Watch her full testimony here and read her statement here. Professor Lisa Heinzerling of Georgetown Law, who also spoke at ACS's Supreme Court Preview event on Thursday, warned Senate Judiciary Committee members that Kavanaugh has targeted regulatory agencies for derision and destruction: "The opinions that Judge Kavanaugh has written in his twelve years as a judge make clear that, as a justice, he would unsettle the independence, legal authority, and protective missions of administrative agencies." Watch her full testimony here and read her statement here. Professor Peter Shane of Ohio State University Moritz College of Law spoke about the nominee's dangerous approach to constitutional questions of executive power and presidential accountability: “Both on and off the bench, [Judge Kavanaugh] has crusaded for an indulgent interpretation of the President’s constitutional powers that could effectively undermine a President’s accountability to law.” Watch his full testimony here and read his statement here. Other witnesses also urged senators to vote against Brett Kavanaugh's confirmation, including a Parkland school shooting survivor who was concerned about the nominee's views on assault weapons and Rochelle Garza, the lawyer whose client Kavanaugh ruled against last year in the case of an undocumented teenager seeking an abortion in Texas.